What if a motorcycle could carry more than two people? No sidecars, no tricks. Yeah, we know that scooters in Bangkok, Mumbai, and Manila shuttle several people plus poultry and grain to feed it, but what if you want to offer your passengers some semblance of comfort and take them farther than just across town? To put a finer point on, what would a motorcycle look like if it was actually designed to haul the whole family? Well, necessity is the mother of invention, right? The longer these questions spun through our heads, the more we knew we had to tackle a solution. This story is based on the latest episode of Throttle Out, now available at MotorTrend On Demand. You can find Ari and Zack on social media at @arihenning211 and @zackcourts. We set out to bridge the gap between the luxuries that motorcycles can afford and the utility they are known to provide all over the globe. Simply put, we decided to build the first Sport Utility Cycle. Seating for four or five, room for plenty of cargo, and enough performance to haul the whole shebang up the side of a mountain. The candidate would need to have a steel frame — since nobody on the show knows how to weld aluminum — a properly torquey engine, and of course it should be dirt cheap, since this concept might be a total bust. Our producer wants to make entertaining video, not expensive scrap metal. Sometimes, things need to fall apart a little in order to come together. Such was the case of the first SUC. Note the Telelever arm on the front of the bike reaching back, which would be the anchor point for the steel-tube extension. Photo by Spenser Robert. What we found was a 70,000-mile BMW R 1150 R in seriously rough shape. Bingo. Step one in creating a multi-person motorcycle? Lengthen it. Should that be four feet longer, or five? A flip of a coin settled the argument: five feet. Besides separating braking forces from the suspension action, BMW’s Telelever front end is brilliant because it unbolts from the engine in about 10 minutes. With the bike bisected and the two halves resting an arm span apart, we began to chop, grind and weld sections of square steel tube to create a framework to reconnect the bow to the stern. Under the fuel tank lives a singular spine of square tube that connects the neck of the BMW’s stock front subframe to the main scaffolding, which in turn braces to the bottom of the Telelever. Photo by Will Gordon. Thanks to the modular nature of the R 1150 R, lengthening the chassis was fairly straightforward, though replicating the orientation of the Telelever pivots took an embarrassing amount of head scratching and dodgy trigonometry. The biggest challenge was stretching the hydraulic-clutch line and throttle cable. We ended up linking together two spare brake hoses to plumb the clutch master cylinder to the slave cylinder, and we used welding wire to make a 10-foot throttle cable. Then it was on to the wiring harness, which, despite introducing over 100 new potential failure points, yielded a lit dash and humming fuel pump when we flipped the key. An 11-foot motorcycle definitely requires a one-of-a-kind custom wiring job. Photo by Spenser Robert. And with a few stabs of the starter button, the Frankenbike R 1150 R shuddered to life, albeit with a scream from the alternator belt that sounded vaguely like “kill me.” Our creation was longer — now boasting 117 inches between contact patches, compared to the 58.5 that BMW intended — but it was not yet a Sport Utility Cycle. Sliding Coleman coolers into the openings in the frame scaffolding yielded storage space, and tack-welding a spare motorcycle seat and a folding chair to the chassis made room for three additional passengers. True, one of those passengers was technically more of a copilot, since they now had rear-brake and shifting duties, but we had a completed SUC. Which meant it was ready for a test ride. Ready for the first shakedown run in the alley. Photo by Will Gordon. We had so many questions. Chief among them, would Ari’s amateur welds hold or would the chassis snap and sever the pilot’s legs? Those first few yards down the alley were nerve-wracking, but once underway the SUC proved to be a smooth roller. Sure, the thing steered like it had two flat tires and the turning radius tripled, but it didn’t handle much worse than some of the fat-tire choppers of the early 2000s, and we rolled around the block and back to the garage feeling pretty accomplished. The problem was, with only two people on board, all we had was a ridiculously long motorcycle. As afternoon slipped into evening and a light rain began to fall, it was finally time to load the SUC to full capacity and put this concept to the test. The camera crew that had been watching us struggle and stress over this contraption for the past three days was enlisted as somewhat willing and visibly nervous passengers. The lower sections of bracing for the frame were built around coolers, meaning once complete we had built-in storage. They press in and out, offering a place to sit on a picnic or waterproof and insulated storage while you’re on the road. Photo by Kevin Wing. With Zack’s steady hand at the helm, the SUC and its five souls teetered around the block, heavy as a Fiat 500. We rounded the first left, then the second, the third, and finally the fourth turn back into the alley. The rig dragged its belly crossing the gutter but came to rest in front of the garage with passengers and chassis welds fully intact. 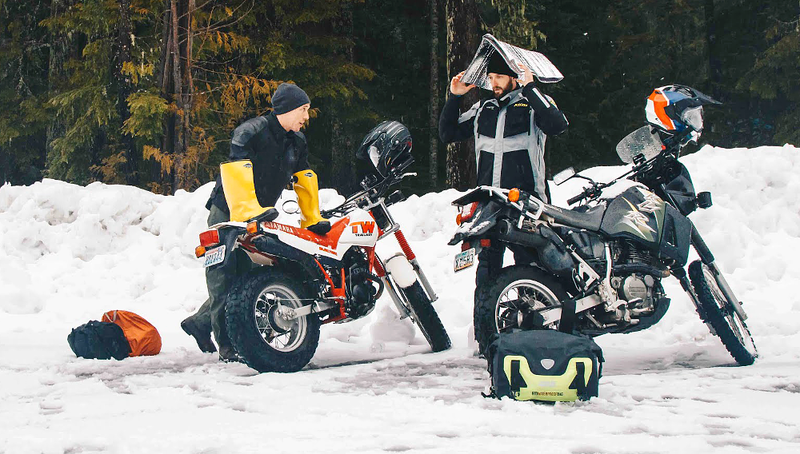 We’d built a five-person motorcycle with a seat for each rider, heated grips for the pilot, liters of storage, two extra gallons of gas, charging ports for accessories, even an “Oh heck” handle for co-pilot security. Not to mention the shaft drive, 1,150 cc, sophisticated suspension, and other premium features inherent to the BMW’s design. Like a dog or a monkey in space, our brave mannequins helped prove that the SUC has room for five bodies. Julie and Cliff held hands for comfort and security, while Melissa was alone in the back. Photo by Kevin Wing. For the next phase of testing we needed to hit the road and explore the “sport” and “utility” aspects of the SUC — that meant getting from point A to point B, via asphalt and dirt. We figured Lake Arrowhead, nestled high in the mountains about 100 miles northeast of Los Angeles, was as good a weekend destination as any. And while live passengers would have been ideal, the camera crew was needed to, well, document the trip. 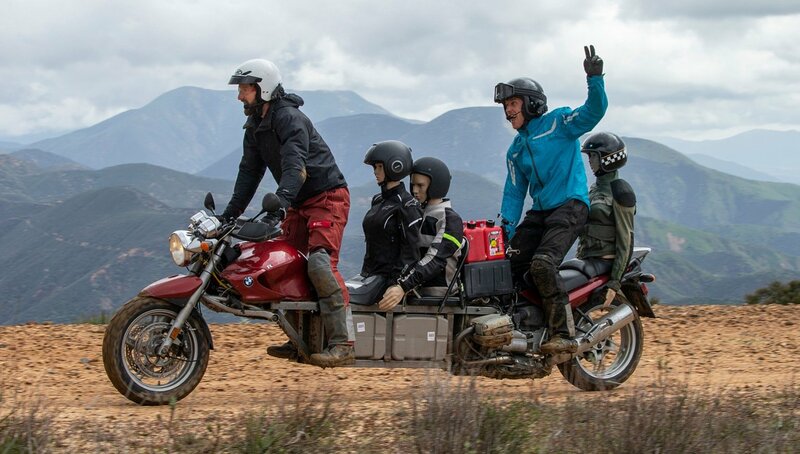 Instead, we zipped the helpless mannequin torsos of Julie, Cliff, and Melissa into riding gear, strapped them to the SUC’s extra seats and rolled out into one of the rainiest days SoCal has ever seen. As if piloting the SUC wasn’t adventure enough, Biblically wet conditions made it especially daunting as we crossed the suburban sprawl on surface streets. No one seemed more excited than the drivers we encountered, as evidenced by countless cellphone photos, thumbs up, and wide-eyed stares we received as we rolled down the road. Wet pavement aside, with every mile traveled our confidence in the bike increased. You have to steer forcefully and early, but man, does a 117-inch wheelbase make for a stable bike! Early on, gear shifts required clear communication via our Sena 10C headsets, but the first time the pilot forgot to ask for an upshift and the copilot instinctively grabbed a gear, we realized with a laugh that collaborative shifting was second nature. I guess that’s what you get when you’ve been riding together for 15 years. By late afternoon we’d made it 75 miles. The frame hadn’t cracked, the throttle cable hadn’t snapped, and we’d even been so bold as to venture onto the freeway and wick it up to 70 mph for a spell. Everyone from truck drivers to bystanders took notice of our 11-foot two-wheeler, which was both encouraging and disturbing. Disturbing because we knew it was just a matter of time before the SUC attracted the wrong kind of attention. Sure enough, just a few miles later we passed a police officer, and as we looked back to see the cop make a U-turn we quickly discussed what an arrest would mean for the remainder of the episode, and our licenses. To our surprise, the cop didn’t turn on his lights as he drove up next to us. Instead, he rolled down his window and hollered through the pouring rain for us to pull over. Like everyone else we’d encountered, he just wanted a picture. “This is the wildest thing I’ve ever seen,” said the officer, who normally patrolled on a two-wheeler but was in a cage today due to the rain. After answering questions about what the SUC was and how it was to ride (but not a single question about registration, insurance, or the fact that the pilot didn’t control the gearbox! ), we were back on the road, feeling more encouraged and confident than ever. The SUC had made it across the city, made dozens of people smile, and even made an officer of the law rethink what a motorcycle can be. Now the SUC just had to get up a mountain. To our great surprise, the SUC handles gently sweeping twisties like a German sport sedan — composed, predictable and smooth. In a parking lot, not so much. Photo by Kevin Wing. We’d finally made it out of suburbia and into the foothills. After slaying several miles of sweeping mountain curves, we saw what we were after for the SUC’s final test: a truck trail. As unwieldy as the SUC can be, the single-track nature of the machine allows it to take on some pretty gnarly stuff. Photo by Kevin Wing. By the time we peeled off the pavement, we were feeling very confident navigating our 11-foot contraption through the world and were excited to see how it would handle some dirt. The horrendous rain had packed the coarse, granular gravel road to a perfect surface, and initially the going was smooth. The slimy deposits of silt from massive runoff were, unfortunately, well camouflaged in the terrain. We thought for sure we would bottom out over the water bars running across the road or ricochet off the rocks protruding from the dirt, but the bike never missed a beat. We even got heady enough to click the SUC into second gear. Fording a massive puddle was no big deal for the SUC, despite the fear in the eyes of the pilot and co-pilot. Julie and Melissa remained stoic and calm, as always. Photo by Kevin Wing. Slightly cambered climbs seemed to be our worst enemy. A loss of traction at the front meant the bike was almost certainly going over, even with two legs frantically deploying to prop it up. Picking a line has never been more important than when riding the SUC, but as long as the momentum stayed up it trundled along pretty assertively. The suspension even held up well with our questionable new geometry and extra weight. We were continually amazed at how rugged and capable the SUC turned out to be. In fact, even after miles of off-road punishment and a few small crashes, the only thing that ended up breaking was the headlight and mannequin Melissa’s arms. As ugly and cheap as it was, the Sport Utility Cycle had been realized, and it was a lot of fun to ride. The SUC’s potential downsides compared to a typical SUV include getting muddy when you tip over and decapitating yourself on a random sheet of corrugated metal. But hey, at least you can lift it back onto the trail if necessary. Photo by Kevin Wing. We arrived at our weekend-getaway hotel as you might expect from a day-long ADV ride: tired. But frankly, we were also glowing with what the SUC had accomplished. Yes, if we had more time we would have added some features. Linkages for the rear brake and shift lever, for one, so that you don’t need a copilot to change gears on the fly. Some footpegs for the #2 and #3 passengers would be nice, too, and would be as simple as bolting on some run-of-the-mill foldable units. Or maybe a folding floorboard that could be deployed. Luckily, Julie and Cliff (for those who have been keeping track) didn’t have legs, so it didn’t matter for our trip. Julie, Cliff and Melissa were no help at all when an extra push was needed. Photo by Kevin Wing. So, it could be that necessity is the mother of invention, but as you can tell we would be the wrong people to ask. If you’re looking at these photos and thinking that there is no true need for a 11-foot-long BMW, you’d be right. Maybe we’re off on a different branch of the tree, then. Maybe curiosity is the estranged uncle of innovation? Sure, the SUC might feel like a bit of a black sheep pulling into the mountain resort next to Range Rovers and Volvos, but let’s be honest: A vehicle like the SUC also announces that you’re prepared to party a little harder. Photo by Kevin Wing. Whatever the turn of phrase, we think there’s genuine merit in the concept of the SUC. For all the talk from major manufacturers of single-track mobility changing the landscape of modern transportation, there are no viable ways to haul more than two people on two wheels in the first world. And if a couple of idiots with 30 feet of steel tube and a welder can make this, imagine what the collective minds at a real motorcycle company could do if they put some resources into it. It’ll probably never happen, but if it does we’ll be the first to stand up and start a slow clap.